J.C. Walker & Sons Corporation is an American company based in Michigan. We specialize in playground equipment and playground development and have been in business for over 15 years. We filed and registered our Octopit USA trademark in December of 2012 and launched the Octopit USA gaga ball pit the following year. All the parts for our Octopit USA gaga ball pit are made, right here, in the USA and are built to last! Use both indoor and in the out of doors. Personal use in your backyard. Our easy to install gaga court, also known as an octoball court, takes approximately 15 minutes to set up or take down. The octoball court can be used portably or installed permanently, providing endless hours of fun and energetic activity. Our unique snap together system makes this a simple operation. There are no nuts, bolts or screws to hassle with and that makes for a non-complicated and convenient setup. Customized gaga ball pit dimensions and colors are also available options. 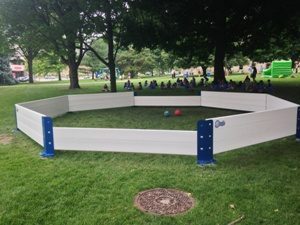 Durable Materials: The Octopit USA portable gaga pit is durable and well-made with sturdy steel legs and reinforced, lightweight, polyvinyl side rails. These units are designed to withstand countless games of gaga ball and are built to last. Heavy duty 3/16″ steel leg-stands, lightweight polyvinyl side rails and steel reinforced connection points are coated with a protective power-coated finish. With other gaga pit models, you have to worry about splintering or rotting wood, but there are no worries here with our top quality materials! Octopit USA’s gaga ball pit can endure constant game play in all weather conditions. Unique Features: Octopit USA’s gaga ball pit is different than any other pit or playground equipment on the market. It features a convenient, portable design that can be easily taken apart for space-saving storage. Transport your gaga pit anywhere or install it permanently on your playground! Our trademark, non-marking, skid-proof, rubber foot pads prevent damage to any floor and keep the pit from moving during usage. We also offer custom dimensions and leg leveling adjustment to accommodate your particular needs. Warranty: Although we are certain that your gaga ball pit will last forever, we offer a limited lifetime warranty for your peace of mind. You can be assured that we are committed to the continued, uninterrupted enjoyment of your gaga ball game! Contact our professional staff to learn more! Call or text us at (248) 752-8165 to order your Octopit USA gaga pit today! All material and labor for the Octopit USA gaga ball pit is made in the USA. Built by Americans right here in the United States of America!